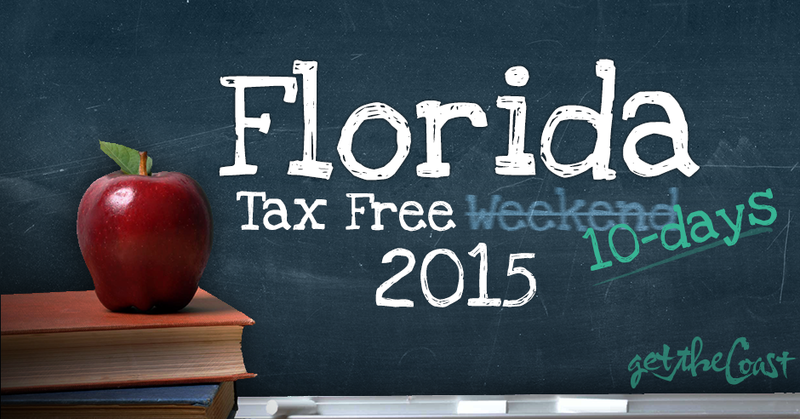 Florida’s Tax Free Holiday is extended to last a full 10 days starting Friday August 7th. [blocktext heading=”STARTS:” class=””]12:01 a.m., Friday, August 7, 2015[/blocktext][blocktext heading=”ENDS:” class=”orange”]11:59 p.m., Sunday, August 16, 2015[/blocktext]The back-to-school sales tax holiday will begin at 12:01 a.m., Friday, August 7, 2015, and end at 11:59 p.m., Sunday, August 16, 2015. Personal computers and certain computer-related accessories on the first $750 of the sales price, when purchased for noncommercial home or personal use. NOTE: If you are a business owner, you may want to also view the FAQ for businesses. Some retailers are bringing extra discounts to the table to make tax free weekend shoppers feel even better about their purchases. Beall’s department stores of Florida is one of those giving additional discounts during tax free week to let customers get more bang for their buck according to this article on the Palm Beach Post. How did we get 10 days to shop tax free this year? So if you are wondering why “tax free weekend” is now “tax free 10 days” this year, here are the cliffs notes. Usually we enjoy just 3 days to shop tax free, but in June of this year, Governor Rick Scott signed into law a $400 million tax cut geared in part towards cable/satellite television and cell phone service taxes (state communications taxes) in addition to other tax exemptions. The cut in the cell phone taxes would save Floridians about $20 a year on a $100 cell phone bill. Florida has had back-to-school sales tax holidays, varying in length, since 1998. 10-days is the longest period of tax free shopping we’ve seen since the inception of the program. It’s seven days longer than the term the House recommended as part of its original tax cut plan. All in all…i don’t think we’ll complain. College textbooks would be sales tax free, saving full-time students about $60 a year in taxes. Elimination of the sales tax charged for gun club memberships. Stops the collection of sales tax on concessions sold at school support organizations, like high school sports booster clubs. If you want to learn more details about the law you can find it here. For more info on the tax cut affecting tax free holiday click here (page 22). Fort Walton Beach Native, father of two, website designer & developer, photographer, drinker of coffee, player of golf.